The census bureau decided to not use racial classification in the 1970 census. The Dominican identity card (issued by the Junta Central Electoral) used to categorised people as yellow, white, indian, and black, in 2011 the Junta planned to replace indian with mulatto in a new ID card with biometric data that was under development, but in 2014 when it released the new ID card, it decided to just drop racial categorisation, the old ID card expired on 10 January 2015. The Ministry of Public Works and Communications uses racial classification in the driver’s license, being white, mestizo, mulatto, black, and yellow the categories used. Black is applied to Dominicans of full or predominant Black African ancestry, which is represented by 5.26% of the Dominican population, according to the leaked 1996 electoral census based on Dominican identity cards data, or by 10.9% of the Dominican population, according to the 1960 population census (the last one in which race was queried). Most Black Dominicans descend from West Africans and Central Africans (almost the half of them were Kongo, with other important ethnicities being the Mandingo, the Igbo people from the regions of Calabar and Biafra, and people captured near the São Jorge da Mina castle), who arrived from the sixteenth to the early nineteenth century as a result of slavery, while many others descend from immigrants who came from the United States during the 19th century or from the Lesser Antilles during the 20th century. Currently there are also many black immigrants, particularly from Haiti, who can be included within the Afro-Dominican demographics if they were born in the country or have Dominican naturalization. Black Dominicans make up a significant minority of the country's population, but there is a lack of recent official data and it is not possible to quantify their numbers because the National Office of Statistics (ONE) does not collect racial data since 1960 because of the race taboo and "political correctness" that originated after the fall of Rafael Trujillo’s dictatorship; though the Central Electoral Board still collected racial data until 2014. According to a 2011 survey by Latinobarómetro, 26% of the Dominicans surveyed identified themselves as black. In 1502 (or 1503), the Spanish Crown finally acquiesced to the colonists' demands for enslaved Africans. The Santo Domingo colony, the only European possession yet in the Americas, had already produced a devastating effect on the Taino, Lucayan (Arawaks), and Kalinga (Caribs) populations.! A decade of intense exploitation and deadly waves of plagues had reduced the indigenous populations to levels that even the Spaniards considered dangerous. As the Hispaniolan Tainos (and Cigüayos) declined during the first couple of years of colonization, the Christopher Columbus Administration had gone against the wishes of Isabel I of Castile and had begun the first European slave trade on the western side of Atlantic. Raids that cleared out from Santo Domingo under the disguise of pacification and to evangelize nearby islanders had brought in other Amerindians to the colony. They were a large number of enslaved Lucayos from the Bahamas and Kalingas from the eastern islands. Now toiling alongside native Hispaniolans, these war captives became the first enslaved foreign workers on the island of Aytí, one of the indigenous names for the island that Columbus called Hispaniola. By the turn of the century, not even the captured neighbors could supply the labor demands of the mines and plantations. Rudimentary mining techniques and the always backbreaking mass-production of food-stuff required an ever-growing number of coerced workers. Expanding the colonization project to Puerto Rico and requesting the Crown permission to purchase enslaved Africans were the only two solutions colonists seemed capable of conceiving. Ferdinand I of Aragon, widowed and freed from Isabel's more cautious hand, granted both wishes to the embattled colonists in the Indies. It was never a liberal expansion nor an open trade, however. Though unrestrained by religious piety, Ferdinand, who was the ideal Prince in Machiavelli's imagination, was wary in the extreme of potential Conquistador-owned kingdoms (medieval style) in his new possessions, and of slave rebellions in the colonies. So, the first group of enslaved Africans to arrive at the Ozama River were not Piezas de Indias purchased from the Portuguese traders, but a select group of seasoned Black Ladinos. The profit too was meant to stay within his kingdom. Indian resistances, flights, and diseases, however, forced the crown to open the market to thousands of bozales, enslaved Africans directly from the continent. In 1522, the first major slave rebellion was led by 20 Senegalese Muslims of Wolof origin, in an ingenio (sugar factory) east of the Santo Domingo colony. Many of the insurgents fled to the mountains and established what would become the first autonomous African Maroon community in America. With the success of this revolt, slave revolts continued and leaders emerged among the African slaves, including people already baptized Christian by the Spanish, as was the case of Juan Vaquero, Diego de Guzmán and Diego del Campo. The rebellions and subsequent escapes led to the establishment of African communities in the southwest, north and east of the island, including the first communities of African ex-slaves in western Hispaniola that was Spanish administered until 1697, when it was sold to France and became Saint-Domingue (modern-day Haiti). This caused some concern among slaveholders and contributed to the Spanish emigration to other places. Even as sugarcane increased profitability in the island, the number of escaped Africans continued to rise, mixing with Taíno people of these regions, and by 1530, Maroon bands were considered dangerous to the Spanish colonists, who traveled in large armed groups outside the plantations and left the mountainous regions to the Maroons (until 1654 with the conquest of Jamaica by the Corsairs of British Admiral William Penn and general Robert Venables). With the discovery of precious metals in South America, the Spanish abandoned their migration to the island of Hispaniola to emigrate to South America and Mexico in order to get rich, for they did not find much wealth there. Thus, they also abandoned the slave trade to the island, which led to the collapse of the colony into poverty. Still, during those years, slaves were used to build a cathedral that in time became the most oldest in the Americas. They build the monastery, first hospital and the Alcázar de Colón, and the Puerta de las Lamentaciones (Spanish: Gate of Mercy). In the 1540s, Spanish authorities ordered the African slaves building a wall to defend the city from attacks by pirates who ravaged the islands. After 1700, with the arrival of new Spanish colonists, the African slave trade resumed. However, as industry moved from sugar to livestock, racial and caste divisions became less important, eventually leading to a blend of cultures—Spanish, African, and indigenous—which would form the basis of national identity for Dominicans. It is estimated that the population of the colony in 1777 was 400,000, of which 100,000 were Europeans and Criollos, 60,000 African, 100.000 mestizo, 60,000 zambo and 100,000 mulatto. At the end of the eighteenth century, fugitive African slaves from Saint-Domingue, the western French colony of the island fled east to Santo Domingo and formed communities such as San Lorenzo de Los Mina, which is currently part of the "city" of Santo Domingo. Fugitives arrived from other parts of the West Indies as well, especially from the Lesser Antilles, dominated by French, English, Dutch, etc. In 1801, Haitian revolutionary leader Toussaint Louverture, abolished slavery in the east of Santo Domingo, freeing about 40,000 slaves, and prompting much of the elite of that part of the island to flee to Cuba and Puerto Rico. However, slavery was re-established in 1809 when the Spanish recovered the area. At the same time, the French governor Ferrand imported a second group of Haitian slaves to build the French colonial enclave Puerto Napoleon (Samana). Slavery was again abolished in 1822 by Haitian president Jean-Pierre Boyer, during the Haitian unification of Hispaniola which began in February of that year. In 1824, African American freed people began to arrive under the Haitian administered island, benefiting from the favorable pro-African immigration policy of Boyer since 1822, called the Haitian emigration. Called the Samaná Americans, they mostly settled in Puerto Plata Province and the Samaná Peninsula regions. In 1844, one Afro-Dominicans Francisco del Rosario Sánchez freed the country along with Matías Ramón Mella and Juan Pablo Duarte of the Haitian rule. Between the late nineteenth and early twentieth century, black laborers from the British West Indies came to work in the sugar plantations on the east of the island. Their descendants are known today by the name of Cocolos. The slave trade involved nearly all of Africa's west coast inhabitants to be forcibly taken to the new world. Most slaves tended to come from mostly the Kongo people of West-Central Africa (present-day Angola, Republic of Congo and the Democratic Republic of the Congo), along with the Igbo (originating from west from Nigeria), Yoruba, Akan and Mandinka tribes. Others African ethnic groups arrived to colonial Santo Domingo during the slavery´s period were: Wolof (imported from Senegal), Aja (also called Ararás in Santo Domingo and imported from Dahomey, current Benin), Ambundu (from the Kingdom of Ndongo, in north Angola), Bran (originating from Brong-Ahafo Region, west from Ghana), Fulbe, Kalabari (originating from slave port from Calabar, in Nigeria), Terranova (slaves bought probably in Porto-Novo, Benin), Zape (originating from Sierra Leone), Bambara and Biafada (this latter was originating from Guinea-Bissau) people. The Wolof were imported to Santo Domingo from Senegal in the first half of the sixteenth century, until the import of this ethnic group was prohibited after his rebellion in 1522. Many of the slaves were also Ajas, usually taken in Whydah, Benin. The Ajas arrived in Santo Domingo, were well known for having made religious brotherhoods, integrated exclusively for them, the San Cosme and San Damian. The National Institute of Statistics (INE) does not collect racial data since the Census of 1960. In that census, the ethnic features were obtained by direct observation of the people registered by the enumerator, without any questions asked. About 73% of the population was classified as mestizo (note that in the 1920, 1935, 1950 and 1960 censuses referred to mixed-race people as mestizo, never as mulatto), 16% was classified as white, and 11% was classified as black (1,795,000 of people). According to scholar Silvio Saillant, "today.' Blacks and mulattos make up nearly 90 percent of the contemporary Dominican population." Dominican Republic is one of the few countries in the world where the majority of the population is made up of multiraciales predominately European and African. So based on these figures, people who self-identify as being "mixed with Afro-ancestry" are at least 86% of the population, numbering at about 8,518,000 people. Although, most of Black Dominicans are descendants of slaves imported to the country and who speak Spanish, there are also two Afro-communities that have English as their mother tongue: Samaná Americans and Cocolos. Samaná Americans from the Samaná Peninsula, are descendants, of freed slaves from the United States, who entered the country in 1824 when it was under Haitian rule, because of the favorable pro-African immigration policy of Haitian president Jean-Pierre Boyer, constitute the most sizable group of native English speakers in the Dominican Republic. Aware of its distinctive heritage, the community, whose singular culture distinguishes them from the rest of Dominicans, refers to itself as Samaná Americans, and is referred to by fellow Dominicans as "los americanos de Samaná". Another Afro-group is the called Cocolo, descendants of those who came to the island from the English-speaking islands in the eastern Caribbean to work in the sugar plantations in the eastern part of the island between the late nineteenth and early twentieth century, they have formed communities in San Pedro de Macorís and La Romana. Its largest population of Afro-people are of Haitian origin, which is also the largest immigrant community in the country and is numbered according to some estimates, to be more than 800,000 people. The 1920 Census registered 8,305 West Indians born abroad (they and their descendants are known as Cocolos) and 28,258 Haitians; the 1935 Census registered almost 9,272 West Indians and 52,657 Haitians. The Haitian population decreased to 18,772 in the 1950 Census, as an aftermath of the Parsley Massacre. Though, African ancestry is common throughout the Dominican Republic, today it is more prevalent in eastern areas such as San Pedro de Macorís, La Romana, and the Samaná Peninsula, as well as along the Haitian border, particularly the southern parts of the border region; it is least prevalent in the Cibao Valley (especially within the Sierra de Zamba region), and to a lesser extent, in some rural communities in El Seibo and La Altagracia provinces, and the western half of the National District as well. However, in the 19th and early 20th century, African ancestry was higher in the southwestern region than in the eastern region, due to the impact of the Afro-Antillean and Haitian immigration during the 20th century. Dominican Republic’s provinces where people of Antillean, Bahamian, and U.S. ancestry predominates. Dominicans of Afro-Antillean and African American ancestry lives concentrated in Puerto Plata, Samaná, Hato Mayor, San Pedro de Macorís, La Romana and El Seibo provinces. Dominicans of Haitian ancestry live scattered across the country, however, communities in the border provinces of Elías Piña and Independence where they predominate among the population, highlighting the presence of European football fields, a very popular sport in Haiti. Haitian immigration is the most important of the immigrations to the Dominican Republic since its independence. Haiti is more impoverished than the Dominican Republic. So, in 2003, 80% of all Haitians were poor (54% in extreme poverty) and 47.1% were illiterate. The country of nine million people has a fast-growing population, but over two-thirds of the jobs lack the formal workforce. Haiti's GDP per capita was $1,300 in 2008, or less than one-sixth of the Dominican figure. As a result, hundreds of thousands of Haitians have migrated to the Dominican Republic, with some estimates of 800,000 Haitians in the country, while others believe they are more than a million. Usually working in low paid and unskilled in building construction, household cleaning, and in plantations. Children of illegal Haitian immigrants are often stateless and they are denied services, as their parents are denied Dominican nationality, and therefore are considered transient residents, due to their illegal status and undocumented, and children often have to choose only Haitian nationality. A large number of Haitian women, often arriving with several health problems, cross the border to Dominican soil during their last weeks of pregnancy to obtain necessary medical care for childbirth, since Dominican public hospitals cannot deny medical services based on nationality or legal status. Statistics from a hospital in Santo Domingo report that over 22% of births are to mothers. Historically, Haiti was wealthier than the Dominican Republic. However, the lack of free lands in Haiti, as land was held by a small group of landlords, motivated Haitian peasants to settle in the borderland region, within the Dominican Republic. Through the years, especially after 1899, the Haitian government claimed the territory populated by Haitians, and under a treaty in 1929 several towns and cities in Central Hispaniola officially became Haitian, comprising 4,572 km2. A Dominican census in 1935 revealed that 3.6% of the population was Haitian. In 1936, the Haitian government claimed more territory and the Dominican Republic ceded another 1,628 km2 to Haiti; the next year, the Dominican dictatorship ordered the Dominicanization of the border (Spanish: Dominicanización fronteriza) and conducted the Parsley Massacre. In 1937, Trujillo, in an event known as the Masacre del Perejil (Parsley Massacre), ordered the Army to kill Haitians living on the border. The Army killed about 10,000 to 15,000 Haitians over six days, from the night of October 2, 1937 to October 8, 1937. To avoid leaving evidence of the Army's involvement, the soldiers used machetes instead of bullets. The soldiers of Trujillo interrogated anyone with dark skin, using the shibboleth "parsley" to differentiate Haitians from Afro-Dominicans when necessary, the "r" of parsley was difficult pronunciation for Haitians. As a result of the slaughter, the Dominican Republic agreed pay to Haiti the amount of $750,000, later reduced to $525,000. The genocide sought to be justified on the pretext of fearing infiltration, but was actually also a retaliation, commented on both in national currencies, as well as having been informed by the Military Intelligence Service (the dreaded SIM), the government Haitian cooperating with a plan that sought to overthrow Dominican exiles. In 2005 Dominican President Leonel Fernández criticized collective expulsions of Haitians were "improperly and inhumane." After a delegation from the United Nations issued a preliminary report stating that it found a profound problem of racism and discrimination against people of Haitian origin, the Dominican Foreign Minister, Carlos Morales Troncoso, gave a formal statement saying "Our border with Haiti has its problems, this is our reality, and this must be understood. It's important not to confuse national sovereignty with indifference, and not to confuse security with xenophobia." After the earthquake that struck Haiti in 2010, the number of Haitians doubled to 2 million, most of them illegally crossed after the border opened for international aid. Human Rights Watch estimated in 70,000 Haitian immigrants legal and 1,930,000 illegal living in Dominican Republic. That idea of black inferiority compared to the white was assumed by the whites because of their pro-slavery and, sometimes aggressive behavior with blacks, eventually would also be assumed by them, into believing, also, that their European culture was superior to the cultures from Africa and subjecting them to same (although many Afro-Dominican were able to maintain his cultures). Also, during the rule of Haiti (1822–44), the government of this country developed a black centrism, centrism that Dominicans refused. Moreover, Haitians made them feel to Dominicans as a distinct people racially, culturally and linguistically, while forbidding them to them use their customs. Dictator Rafael Leónidas Trujillo, who ruled between 1930 and 1961, tenaciously promoted the anti-Haitian sentiment and used racial persecution and nationalistic fervor against Haitians. He is considered blamed for creating the many racial categories that avoided the use of the word "black" and, in 1955, he promotes an emigration from Spain to his country for "whiten" the population, increasing the white population over the black population, which he considered inferior. The practice continued under President Joaquín Balaguer, who often complained that Haitian immigration in the Dominican Republic was blackening the country. In 1990, he was blamed for blocking the presidential aspirations of leading black candidate José Francisco Peña Gómez, spreading rumors that he was actually Haitian. An envoy of the UN in October 2007 found that there was racism against blacks in general, and particularly against Haitians, which proliferate in every segment of Dominican society. According to a study conducted by the Dominican Studies Institute CUNY, about 80% of the contemporary Dominican population has ancestry from West and Central Africa in different degrees. A variety of terms are used to represent a range of skin tones, such as moreno, canelo, Indian, indiesito, blanquito, and rubio. Ramona Hernández, director of the Dominican Studies Institute at City College of New York asserts that the terms were originally a defense against racism: "During the Trujillo regime, people who had dark skin were rejected, so they created their own mechanism to fight against the rejection". African cultural remnants seen in the Dominican Republic in many different aspects, including music, dance, magic-religious beliefs, cuisine, economy, entertainment, motor habits, and language. Perhaps the greatest influence of African slaves is observed in music and dance. Such influence comes from the dances, that, like the calenda, practiced in the Dominican Republic, as elsewhere in America, from the early years of slavery. We must Father Labat, who toured the West Indies in the eighteenth century, a fairly thorough calenda. This dance derives, according to research by the folklorist Fradique Lizardo, several Dominican popular rhythms. One of the most widespread is the Música de palos (Music of sticks), name that designates both the pace and the membranophones used. National Rhythms with obvious African imprint are sarandunga, Música de Gagá (Ganga's music, arrived from Haiti), Baile de Palos (dance of Sticks), Música de Congos (Music of Congos), Cantos de Hacha (Songs of axe), los congos, la jaiba (the crab), el chenche matriculado (the chenche enrolled), etc. The salve, which in the words of the U.S. ethnomusicologist Martha Davis, is the most typical of the traditional Dominican genres, has two styles: one distinctly Spanish, amétrico and antiphonal, and another polyrhythmic, strongly hybridized between the Spanish and African styles. Among African instruments are the los palos (the sticks), balsié, and the gallumba. It is important to also mark other musical instruments Dominicans of African origin such as the Palo mayor (mainmast), the canoita, los timbales (present in the bachata, also called bongos), and the tambora (Key instrument in the merengue music, the Dominican national dance). For his part, the Bachata is a hybrid of the bolero (especially the bolero rhythm) of the Dominican Republic with other musical influences of African origin and other musical styles like the son, the merengue and the chachachá. On the other hand, there are also music genres Dominican widespread across the country, whose origin is uncertain, being considered of Spanish and African origin, depending of musicologists and historians. Such is the case of the merengue music. So, Luis Alberti, one of the musicians considered as fathers of merengue, thinks that the roots of this music genre are purely Spanish. F. Lizardo, Dominican folklorist, by contrast, thinks that this origin is in the Bara tribe of Madagascar, who came to the island in the eighteenth century and brought a dance called merengue that has spread throughout the Caribbean. A very similar pace, adds Lizardo, arrived today with the Yoruba of Dahomey. In the African polyrhythm was also the merengue. Also often linked to the origin of merengue a dance called URPA or UPA, a native of Havana and arrived in the Dominican Republic between 1838 and 1849. The dance sailed through the Caribbean coming to Puerto Rico where he was well received. One of the movements of this dance is called merengue which apparently is the way selected to call the dance, and came to the Dominican Republic where he evolved into the genre of merengue. However, the Cuban UPA is also a dance whose origin appears to be in West Africa. In fact, in early ls, despite its rise among the masses, the upper class did not accept the merengue for long, because apparently, their connection with African music. Another cause that weighed on the repudiation and attacks the merengue were literary texts that accompany it, usually risqué. Dominican folk music is intimately tied to religious culture, and interpreted primarily in the fiesta de santos (party of saints), also known, according to the area of the country, as velaciones (vigils), velas (candles) o noches de vela (sleepless nights). Other popular rhythms are of Spanish origin, such as the mangulina and the carabiné. Although most black Dominicans are Roman Catholics, magical-religious beliefs prevails among black Dominicans. Layers reflect African Christian syncretism operated since colonial times. The most characteristic feature is the Dominican Vudú, which relates directly to the magical activity. Funeral rites contain many features of African descent that are shared with other American countries. A typical example is the baquiní o velorio del angelito. In the economic field include various institutions of mutual aid, existing both in the fields and in the cities. In rural areas, these institutions are in the form of groups of farmers who come together to collaborate on certain agricultural tasks such as planting, clearing of forests, land preparation, etc. Are called juntas (boards) o convites and have similar characteristics to Haitian combite closely related to the dokpwe of the Fon people of Dahomey. These tasks are accompanied by songs and musical instruments that serve as encouragement and coordination at work. All board members are required to reciprocate the assistance and collaboration in the work of others. After the day is a festival that is the responsibility of the landowner. Another institution of mutual aid, of African origin, is revolving credit system that goes by the name of St. corresponding to esusu and Yoruba. As in Nigeria and other parts of Afroamerica, the San is composed preferably female. It consists, as is well known, in the establishment of a common fund to which each participant's San, contributes with a sum monthly or weekly. Each partner receives, on a rotating basis, the total value of the box, starting with the organized. Some Dominican cuisine and dishes containing some products of African origin. Among the former are the guandul, the ñame and the funde. Typical African dishes seem to be the mangú, prepared with green plantains and derivatives cocola kitchen, the fungí and the calalú. A common drink among the black slaves was the guarapo, made of sugar cane juice . African slaves were forced to build a cathedral that in time became the oldest in America. They built their monastery, first hospital and the Alcázar de Colón. In the 1540s, the Spanish authorities ordered the African slaves to build a wall to defend the city from attacks by pirates who ravaged the islands. They also built the Puerta de las Lamentaciones (Gate of wailing). ↑ The electoral census of 1996 estimated the proportion of black people at 4.26 percent. An estimate from 2009 was as high as 30 percent of the population. 1 2 3 4 5 Moya Pons, Frank (2010). Historia de la República Dominicana (in Spanish). 2. Madrid: CSIC. pp. 50–52. ISBN 978-84-9744-106-3. Retrieved 8 November 2014. 1 2 Cuarto Censo Nacional de Población, 1960. Santo Domingo: Oficina Nacional de Estadísticas. 1966. p. 32. ↑ Sención Villalona, Augusto (2010). Haché, Juana, ed. Historia dominicana: desde los aborígenes hasta la Guerra de Abril (PDF) (in Spanish). Santo Domingo. ISBN 978-9945-074-10-9. Archived from the original (PDF) on 2014-11-29. ↑ De León, Viviano (11 November 2011). "RD será de negros, blancos y mulatos : Reforma electoral eliminaría el color indio". Listín Diario (in Spanish). Retrieved 25 October 2014. 1 2 Néstor Medrano; Ramón Pérez Reyes (23 April 2014). "La JCE acelera cedulación en instituciones del país" (in Spanish). Listín Diario. Retrieved 9 April 2015. Entre las novedades del nuevo documento no se establece como se hacía anteriormente el color de la piel de la persona, ya que, la misma fotografía consigna ese elemento. ↑ Néstor Medrano (10 January 2015). "La cédula vieja vence hoy; miles acuden a centros JCE" (in Spanish). Listín Diario. Retrieved 9 April 2015. ↑ Aníbal de Castro (15 November 2013). "Dominican Republic has a clear, respectful immigration policy". Washington Post. Retrieved 13 January 2016. ↑ James Ferguson (4 July 2003). "Migration in the Caribbean: Haiti, the Dominican Republic and Beyond" (PDF). Retrieved 17 October 2014. ↑ Bryan Schaaf (21 May 2009). "Haiti and the Dominican Republic: Same Island, Different Worlds". Haiti Innovation.org. Retrieved 13 January 2016. 1 2 3 4 5 Frank Moya Pons (2010). Historia de la República Dominicana (in Spanish). 2. Santo Domingo: CSIC. pp. 50–52. 1 2 3 4 5 6 "World Directory of Minorities and Indigenous Peoples - Dominican Republic". Minority Rights Group International - MRGI. 2007. Retrieved 13 January 2016. ↑ José Andrés-Gallego (2010). La esclavitud en la América española [Slavery in Spanish America] (in Spanish). Encuentro. p. 19. ISBN 978-84-9920-504-5. Retrieved 14 January 2016. ↑ P. J. Ferbel (2002). "La sobrevivencia de la cultura Taína en la República Dominicana" [Survival of the Taino culture in the Dominican Republic] (in Spanish). suncaribbean.net. Retrieved 13 January 2016. 1 2 3 Francisco del Rosario Sánchez One of the Padres de la Patria / Fathers of the Patriotism – Colonial Zone-Dominican Republic (DR) – Retrieved 3 November 2012. ↑ Bolívar M. Troncoso Morales. 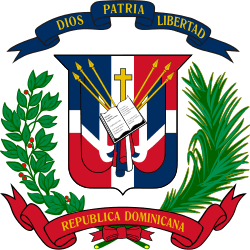 "Origen de la población dominicana" [Origin of the Dominican population] (in Spanish). suncaribbean.net. Retrieved 13 January 2016. 1 2 3 4 5 6 7 8 Carlos Esteban Deive (January 1979). "Notas sobre la cultura Dominicana" [Notes concerning the culture of the Dominican Republic]. Boletín del Museo del Hombre Dominicano (in Spanish). VIII (12). Retrieved 13 January 2016. ↑ El solitario de la vega real: Etnias africanas en la esclavitud en Santo Domingo (The solo of The vega real: Ethnic African slavery in Santo Domingo). Retrieved on 8 February 2012. 1 2 Fuente: Encuesta Latin American Public Opinion Project, LAPOP, "La variable étnico racial en los censos de población en la República Dominicana" (in Spanish). Oficina Nacional de Estadística. Archived from the original on 2013-07-29. ↑ Torres-Saillant, Silvio (1998). "The Tribulations of Blackness: Stages in Dominican Racial Identity". Latin American Perspectives. 25 (3): 126–146. ↑ "African American - Latino World: The Dominican Republic's African-American Descendants". ahorasecreto.blogspot.com. Retrieved 17 October 2014. ↑ "Dominicans From Samana - The Root". theroot.com. Retrieved 17 October 2014. ↑ "Historia, Metodología y Organización de los Censos en República Dominicana 1920-1993" [History, Methodology and Organization of the Census in the Dominican Republic 1920-1993] (PDF). National Bureau of Statistics of Santo Domingo (in Spanish). April 1998. Archived from the original (PDF) on 21 February 2014. 1 2 3 Flady Cordero (30 July 2013). "La desregulación de la inmigración es el negocio del siglo". Hora Cero (in Spanish). Archived from the original on 2 May 2014. Retrieved 2 May 2014. ↑ "Haiti: Economy overview". CIA World Factbook. Retrieved 13 January 2016. ↑ Diógenes Pina (21 March 2007). "DOMINICAN REPUBLIC: Deport Thy (Darker-Skinned) Neighbour". IPS News Agency. Retrieved 13 January 2016. ↑ "Dominican Republic, Haiti, and the United States: Protect rights, reduce statelessness". Caribbean Net News. Reuters. 19 January 2007. Archived from the original on 8 July 2008. ↑ Diógenes Pina (31 October 2007). "Dominican Republic: Gov't Turns Deaf Ear to UN Experts on Racism". IPS News Agency. Retrieved 13 January 2016. 1 2 Diario lider: Afrodominicanos pugnan por su identidad (Leader Journal: Afrodominicans fighting for their identity). ↑ Franco, Franklin (2005-09-02). "Peña Gómez, Balaguer y el racismo (III)". Hoy (in Spanish). Retrieved 29 May 2013. ↑ Tradición Musical Afro-Dominicana (Musical Tradition Afro-Dominican). Posted by Jose Radhamés Veras. Retrieved March 21, 2013, to 22:49 pm. ↑ Historia Dominicana. Conferencia: "La discriminación de la cultura africana en la música dominicana" (Dominican History. "Discrimination of African culture in the Dominican music"). Wrote by Alejandro Paulino. General Archive of the Nation, Thursday November 25, 2010. ↑ Opinión sobre el merengue (Opinion on the merengue). Retrieved March 21, 2013, to 01:20 pm.